Camphor is the white (or transparent), crystalline substance found inside the camphor laurel tree (Cinnamomum camphora) or inside the Dryobalanops aromatica. Camphor can also be synthesized from turpentine oil. Camphor is a mild local anesthetic, with a cooling effect when applied and is also used to relieve itching from insect bites, stings, etc. Small quantities of up to (less than) 50mg may be taken orally. 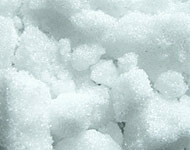 Camphor is used in various cough preparations and is, along with menthol, the active ingredient in various vapor-steam products. The odor of camphor repels insects and reptiles. Camphor is also used to kills fleas. Camphor can be dangerous if ingested in larger quantities. 2g are considered seriously toxic and 4g of camphor can be deadly. Topical applications are usually safer, however one should always exercise caution and never exaggerate with the quantities. Found all over Europe as well as in temperate Asia. Found in Europe, North America, and Argentina. 3. Matricaria discoidea, also called pineapple weed, or disc mayweed. Found in North America and Northeast Asia. Chamomile can be used to treat irritable bowel syndrome (spastic colon), a sore stomach, as a mellow sleeping aid or a mouthwash. It is anti-inflammatory and bactericidal (kills bacteria), as well as mildly antiseptic and disinfectant. If chamomile is taken as a sedative over longer periods, it is possible to develop a tolerance, to become immune to it. Chamomile tea is an ancient folk remedy for diarrhea. First remove the boiling water from heat; take 1 teaspoon of chamomile tea per 1 cup of water; steep for 15 minutes while covered. Chamomile can cause an allergic reaction in people with ragweed allergies, as it is a relative of ragweed. Very large quantities of chamomile can cause vomiting or nausea. Because it contains coumarin, chamomile should not be used in combination with blood-thinners/anticoagulants. Charcoal is the brittle, black, little material that is obtaineded by heating wood or other organic substances in the absence of air. 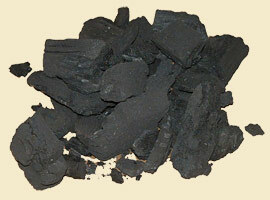 Charcoal can be activated to increase its effectiveness as a filter. Activated charcoal, also called activated carbon, or activated coal is an excellent absorbent of poisons, especially in the case of acute poisoning, and water purifier. Other uses for activated charcoal include diarrhea, flatulence, and indigestion. Charcoal is the most efficient if used within an hour of swallowing the poison. Chocolate refers to the products made from the seeds of the Theobroma cacao tree. Chocolate can have various health benefits, however when talking of chocolate for health, what is meant is the dark kind, with a high percentage (70% or higher) of cocoa in it. Contains cocoa, fat and sugar. The percentages of cocoa vary from country to country. In the EU it should be a minimum of 35% cocoa solids. Dark chocolate with considerably higher percentages (up to 99%) of cocoa is also available. When considering the health effects, only chocolate with a cocoa content of 70%+ can be taken into consideration. Baking chocolate, also known as bitter chocolate is mainly composed of cocoa solids and cocoa butter. Couverture is a chocolate rich in cocoa butter, which is the only fat it may contain. Contains milk in various forms (powedered, liquid, condensed), sugar and a percentage of cocoa solids. This percentage depends on country regulations. In the EU it should be a minimum of 25% cocoa solids. Contains no cocoa solids. Only cocoa butter, milk and (large amounts of) sugar. Some don't consider white chocolate to be a chocolate at all. 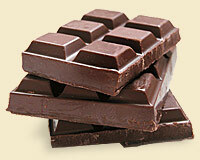 For the health benefits of pure chocolate or chocolate rich in cocoa, see cocoa. Cocoa beans are the seed of the fruit (called 'cocoa pod') of the Theobroma cacao tree. These unprocessed seeds have a very bitter flavor and develop the typical chocolate taste only through fermentation. Cocoa is rich in flavonoids, which is why prolonged, regular (yet moderate) consumption of cocoa greatly benefits the heart, improves blood flow, and helps with learning and memory. The alkaloids in cocoa solids promote the production of serotonin in the brain and are therefore suitable against depression. Chocolate does not necessarily have the same health benefits as cocoa. It is important to differentiate between the different types of chocolate and how high the cocoa content is. Due to the high levels of xanthines, especially theobromine as well as some caffeine, cocoa and its products (such as chocolate) are toxic to many animals, including dogs and cats. See cough, runny nose, stuffy nose. Constipation is a condition of the bowels in which the feces are hardened or dry and the expelling is either infrequent or difficult. Obstipation is severe constipation, in which the passing of stool as well as gas is prevented. Drink a glass of lukewarm (room temperature) water as the first thing in the morning, immediately when you get out of bed. As a general helpful advice, drink at least 6-8 glasses of water per day. During the hot season increase the intake of water. The more water you drink, the better. Coughing is a protective reflex and a symptom, in most cases caused by an infection of the respiratory tract. Alternative common causes are asthma, air pollution, smoking, choking, and others. nasal cavity, throat/pharynx and larynx. trachea, bronchial tubes, bronchioles and lungs. In case of an infection the cough is usually accompanied by a sore throat (pharyngitis). A number of herbal and other natural remedies can bring relief and make it easier for the body to heal itself. Rest and relax; avoid stress. The air should be humid. Raising the humidity with a humidifier or steam inhalations both help. Never underestimate the value of fluids, in form of water and herbal teas. Even "chicken soup" as a remedy is mainly that - an additional way to keep the fluids coming in. Drinking lots of water is always a good idea, but when fighting an infection, the amount of fluids should be increased. A body fighting an infection needs help. Vitamins help, above all vitamin C, especially when combined with zinc. Vitamin supplements should not be the primary option in this case, but natural food sources instead. Some of the foods that contain high amounts of vitamin C are parsley, kiwi fruit, papaya, strawberry, orange, lemon and other fruits. Foods rich in zinc are various meats (especially red meat), salmon, clams, wheat, peanuts, beans and wholegrain cereal. With a cough, adding lemon and honey to an herbal tea of choice is always a plus. ginger tea; thyme tea, or thyme syrup, or steam inhalations with some thyme added; sage, chamomile tea. Gargling with apple cider vinegar. You can mix the vinegar with water. Create a comfortable ratio of vinegar and water, as strong as you can stand it.